Former Korean inseis (Cho Seokbin, Hwang Inseong ...) are much stronger than European amateurs. Even for professional players like me or Catalin Taranu it's hard to challenge them. But even Koreans have hard time challenging young Chinese masters. 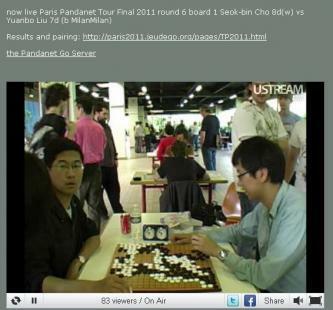 First time in history Cho Seokbin (bin7674) lost 3 games in the single tournament. All 3 against Chinese visitors: MilanMilan, smartrobot and Xue Lei (what is his KGS ID?). Cho had very hard pairing. I decided to post his game with MilanMilan (Liu Yuanbo), tournament winner. Cho laughed to himself for 5 minutes or so after that sequence. Was he winning without that terrible mistake?